Can you believe it’s already December 4? It is amazing how fast time flies when the holidays are approaching. How is your shopping coming? Do you need more gift ideas, or is everything already wrapped and under the tree? I have part of my shopping done, but still need to to do quite a bit! 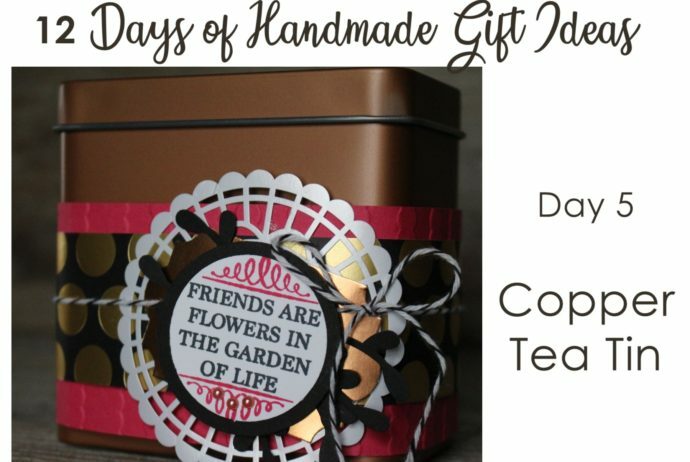 If you need more handmade gift ideas, you’ve come to the right place! 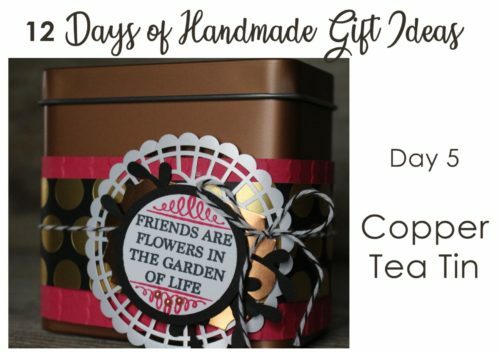 Today is Day 5 of my 12 Days of Handmade Gift Ideas and today I’m sharing a decorated tin! 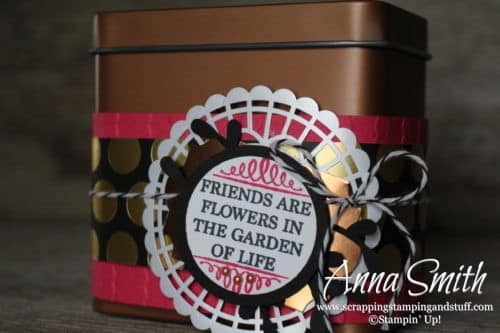 The tin that I used for this is one of Stampin’ Up’s Copper Tea Tins. I love these little guys. They’re big enough to hold some great treats or other small gifts, but not so big that you’ll have a hard time filling them up. They would be great to hold candy, cookies, a small notepad, hot cocoa, tea bags, nail polish, or small lotion bottles, just to give you a few ideas. I love how the metallics look on this project. The tin itself is copper of course, and I used an Everyday Label punch from copper foil paper to place behind the greeting. 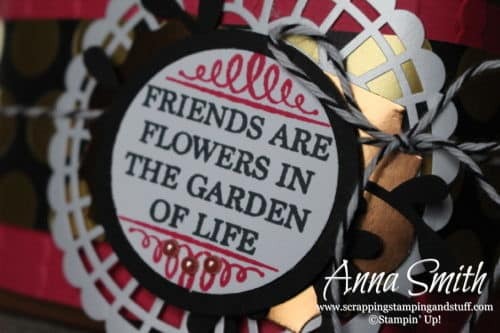 I also used a strip of the Broadway Bound designer paper which has the fun gold polka dots. In the background I used one of our pretty pearlized doilies. And look closely – do you see the three pink pearls from our Share What You Love Artisan Pearls? It’s all about the details. Don’t wait to order what you need to make your handmade gifts – Christmas will be here before we know it! 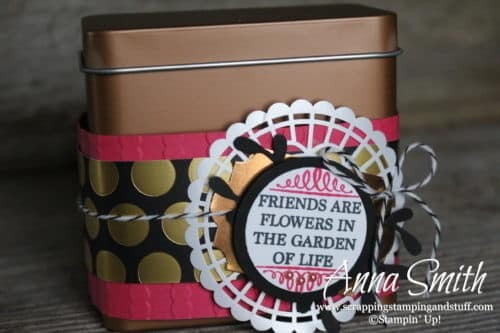 Order the products I used and make this project yourself!